Covered bridges began to dot the Virginia landscape about two centuries ago. Spanning rivers and streams, their number grew to the hundreds. Eventually, they gave way to their vulnerabilities to flood and fire and to the technologies that replaced the wooden peg with the metal bolg and the broad timbers with narrow steel. By 1900, the overhead steel truss bridge had become the engineers’ design of choice. 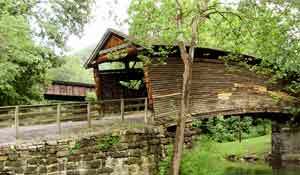 Today, only eight covered bridges built before the mid-1920s are known to stand in Virginia. 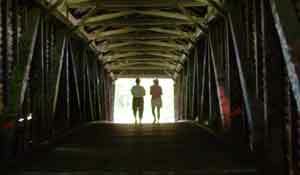 Of these, the Humpback Bridge lays claim to being the oldest of the remaining covered bridges. Humpback Bridge, Virginia’s oldest standing covered bridge, is part of a wayside on Route 60, Alleghany County just west of Covington. It was built in 1857 as part of the James River & Kanawha Turnpike (JR&KT). It succeeds three other bridges at the site. Humpback Bridge stretches over Dunlap Creek, which is a tributary of the Jackson River that joins the Cowpasture River near Iron Gate to form the James River. The first structure was built in the 1820s and was washed away be a flood on May 12, 1837. The second bridge fell victim to the flood of July 13, 1842 and the third bridge, as the annual report of the JR&KT company put it, simply “gave way” in 1856. This 100-foot-long, single-span structure is four feet higher at its center than it is at either end, thus the name, “Humpback.” Traffic across the bridge ceased in 1929, when it was replaced with a ‘modern’ steel truss bridge. It stood derelict, and even was used by a nearby farmer to store hay, until 1954. That year, thanks to the fund-raising efforts of the Business Professional Women’s Club of Covington and the Covington Chamber of Commerce, it was restored and preserved as part of Alleghany County’s history. Humpback Bridge can be reached from I64 by taking Exit #10 to Route 60 and traveling one-half mile east or by taking Route 60 West from Covington.